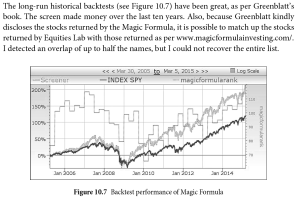 I have been asked numerous times about Joel Greenblatt’s Magic Formula ( https://www.magicformulainvesting.com/ ) in reference to quantitative investing. In this blog post, I’ll share the most recent email exchange I had regarding the topic, and an excerpt from my book that covers the Magic Formula (MF). I think the exchange is informative as to how I view replicating other practitioner and scholarly work … to sum it up, exact replication is not only likely impossible, but could be a gigantic waste of time – data sources are often different, minuscule differences in analytical methods lead to significantly different results. I think this email exchange is instructive for understanding some of the issues and some of the goals quant investors often start with,. These goals of replication before creation are noble, but beyond a point, perfect replication is not particularly useful. I do have a section on the MF (although that’s not the “focus” of the book). I do show how to replicate it, although both backtests and holdings don’t always line up exactly with those from the website and book. You can look at my backtest below and the text preceding it (and actually, if you buy the book, it includes the software to do the backtest yourself). “Thanks for your response and the exert (sic) from your book, Sugata, much appreciated! You mention you are able to return up to half of the stocks he does. Have you managed to improve on this since writing the book? I should also ask, do you use any of the quantitative methods you wrote about to manage your own portfolio? Given the apparent strength of the Greenblatt formula, it is strange to not see it publicised more. You show great results with it yourself, were you convinced? I’m happy to discuss further. You mention you are able to return up to half of the stocks he does. Have you managed to improve on this since writing the book? No – but I don’t really care to – why bother? I should also ask, do you use any of the quantitative methods you wrote about to manage your own portfolio? Given the apparent strength of the Greenblatt formula, it is strange to not see it publicised more. You show great results with it yourself, were you convinced? 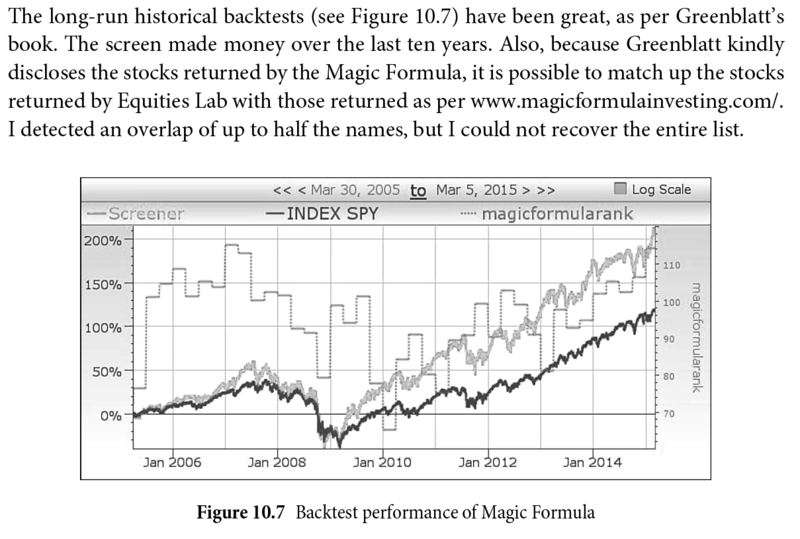 There are many other “formulas” out there – I think MF is an ok value based screen and value investing definitely works. I use simple PE ratios for my value screening, which also works very well. But then, value is only 1 of the 6 or 7 things I look for. Using S&P Capital IQ (I have an account through my employer) I manage to return about 2/3s of his list. Though I seem to have maxed out increasing this number by tinkering with the screen, hence my search for research done by others. Why try to recreate his list? I don’t see the point. I think a 2/3 match is good enough to know you’ve got the general idea right. I am also keen to apply it to other countries (in particular, the UK, <redacted>). I can’t do this until I have done the back-test myself. Coming across historic index data is difficult though. For example, if our strategy were: buy all profitable stocks in equal amounts, and rebalance quarterly …. The report for the backtest would present how this strategy would have performed historically, and we could compare this to the index returns or other returns.